This chart of the 2-yr Treasury yield—which is the market's best guess as to the average level of the Fed funds rate over the next two years—has jumped to its highest level since last May. Today's jobs report provided further impetus to the market's increasing confidence in the economy's ability to grow, and that in turn has resulted in the expectation that the Fed will begin to raise short-term rates sooner than previously expected. 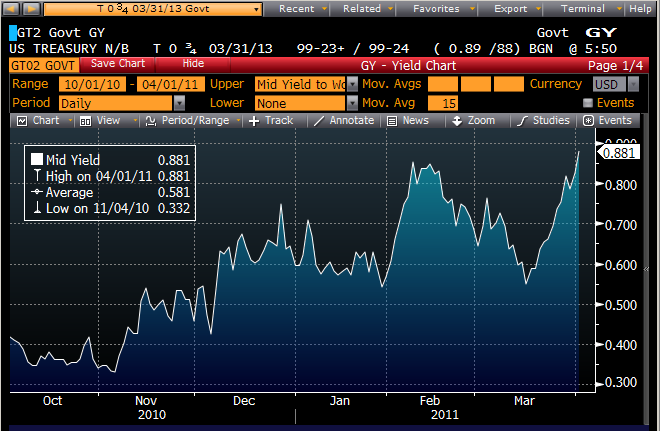 I hasten to add that the market still doesn't see much of a chance of a rate hike any time this year, but expectations are rising steadily for a series of hikes in 2012. So while the market is still relatively downbeat on expectations for the economy, it is becoming less so in the face of stronger-than-expected economic statistics such as today's jobs report. 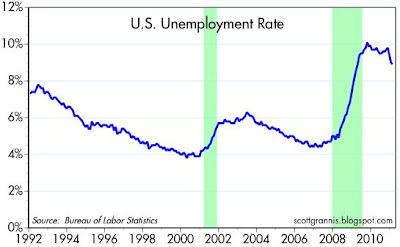 The unemployment is moving lower, though it's still quite high. At the current pace of jobs growth, we should see continued modest declines in the unemployment rate. 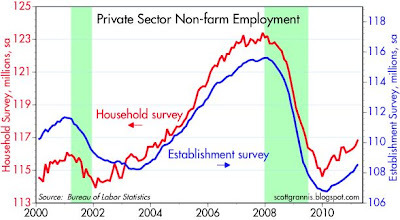 This chart compares private sector employment according to the two competing surveys that are taken each month. 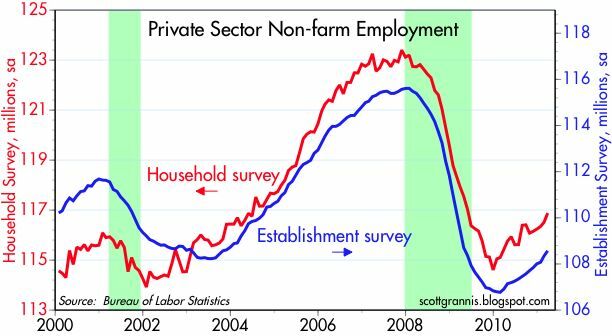 Since the recession low, the establishment survey has uncovered 1.8 million new jobs, while the household survey has recorded 2.1 million. Both surveys are showing that private sector jobs have increased at an average of 140K per month since the recent recession low, with the average of the two showing a rather impressive 300K being added in March. We're definitely making progress, and I expect to see things pick up further when Congress recognizes the need for serious budget reform. 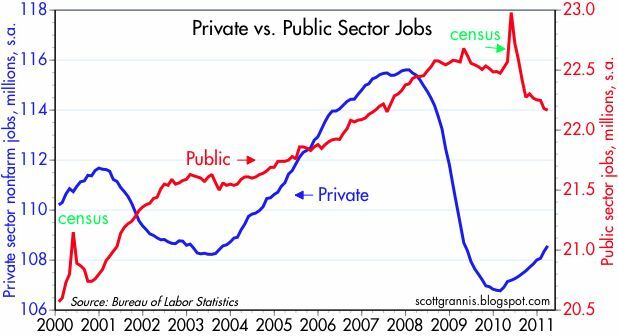 In a similar vein to what we saw with the Monster employment indices yesterday, this chart highlights the significant difference between demand for private and public sector jobs. Government expanded hugely following the 2001 recession, while the economy as a whole and especially the private sector recorded only a moderate amount of growth. We are now two years into what should prove to be a multi-year battle to shrink government so as to strengthen the private sector. 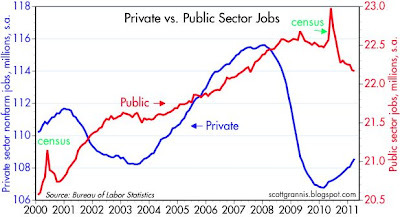 Based on recent trends and the need for most state and local governments to trim their budgets and renegotiate union benefit packages, there will be perhaps a million more workers currently in the public sector who will be forced to migrate to the private sector in coming years. This adjustment will be painful and contentious, but it's necessary if we are to reduce the government's outsized influence in the economy and help the economy become more efficient.
" I expect to see things pick up further when Congress recognizes the need for serious budget reform." Is that the US Congress? The Congress of "We don't like the deficits that the other party is running up. It should us running up the deficits." ? Should I vote for the "Deficits Don't Matter" Party (When We Control Congress)? Or the "We Soon Have to Tackle the Deficit" Party? I used to think I was the most optimistic, idealistic, naive, utopian man of the planet. But maybe I have been eclipsed by Scott Grannis.